I'm not a fan of boiled dumplings (otherwise known as shui jiao = water dumpling) but I can easily inhale a dozen guo tie (pot stickers). They're great as snacks or a main meal. My English friends would gobble these down and often request pot stickers if they were coming around for a meal. I love biting into the crispy base and slurping a bowl of chicken broth with watercress. They look complicated but in reality, are so easy make. 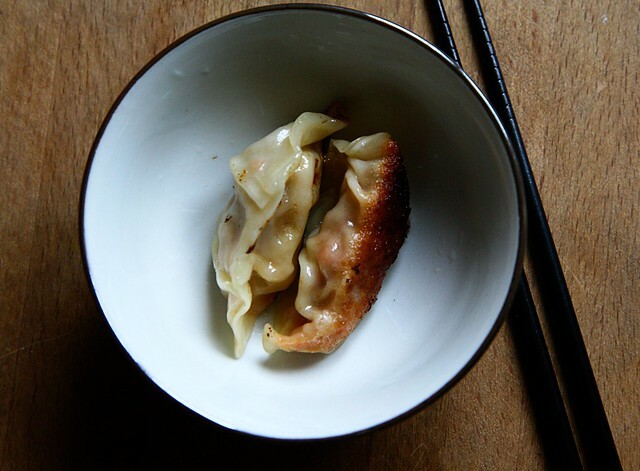 Dumplings have been part of the Chinese cuisine for more than 500 years. They were predominantly eaten on Chinese New Year Eve by the Northern Chinese. I'd never tasted the boiled version, shui jiao until a friend of mine from North-East China took me to a dumpling restaurant. The Japanese have their gyoza, the Koreans call theirs mandu and of course, the well known ravioli. 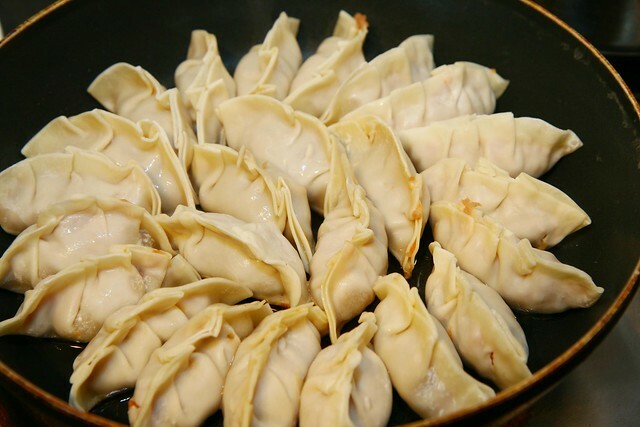 The shape of the dumplings look very similar to the golden ingots used during the Ming Dynasty. Knowing most Chinese symbolisms are to do with money, I'm assuming that eating these dumplings will bring prosperity. This brings back to mind my very first job at a telecommunications call center. All the Chinese customers (including my own dad!) always demanded numbers like 1388 or 1688. I once unknowingly gave a Cantonese customer the number 348 4444 which I thought was such an easy to remember telephone number. She was beside herself with rage, "you want me to DIE DIE DIE and to make sure that I'm truly dead, I DIE again?!" Now I'm a bit of cheat and I take plenty of shortcuts. Terri of Hunger Hunger is an incredible cook who is also the crowned the queen of Jellyrific contest held by Royal Selangor a few weeks ago. I suggest you check out her made-from-scratch dumplings which are far more authentic than mine. I tend to stick to store bought dumpling skins. I am pretty pedantic and will only buy ones that do not contain any preservatives or color. There are so many variations of fillings you could make. I make it up as I go along. 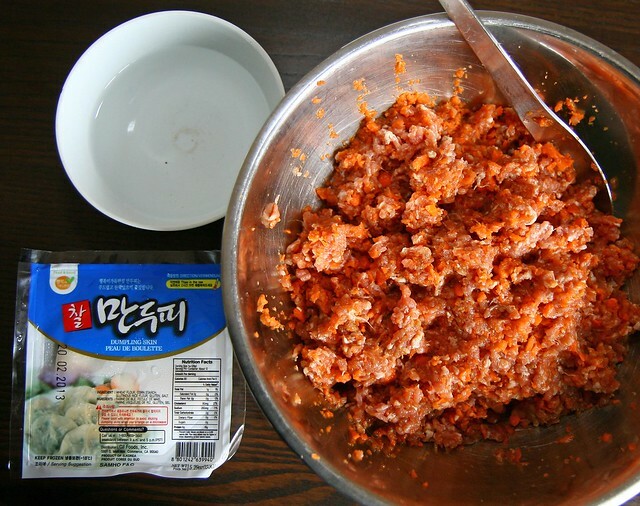 In this case, I've included finely chopped carrots for the extra crunch. Besides, this is one way of getting Lil L to eat cooked carrots. She is "allergic" to veggies that aren't green. On a side note, I'm usually pretty good at multi-tasking. Or so I thought. While I'm fiddling around with my camera and trying to fry the dumplings as well as boiling a kettle of water, I managed to burn the dumplings and my hand. Argh. I fail miserably in arts and craft so doing beautiful pleats on the dumplings is an impossible task for me. They don't have to look perfect. 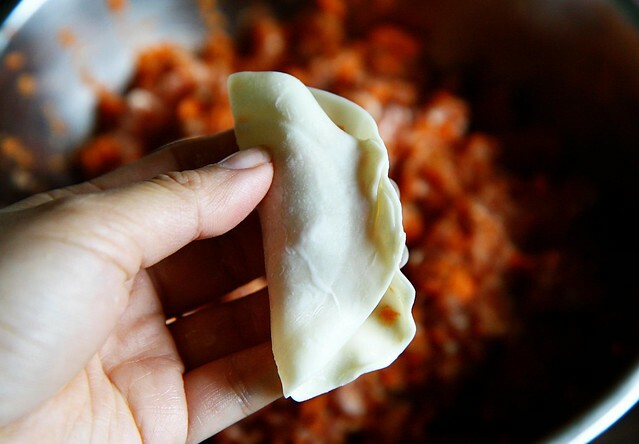 As long as the filling is sealed tightly inside the dumpling skin is good enough. 1. Mix all the ingredients together in a large bowl. I prefer using my hand because I can do it faster this way. 2. 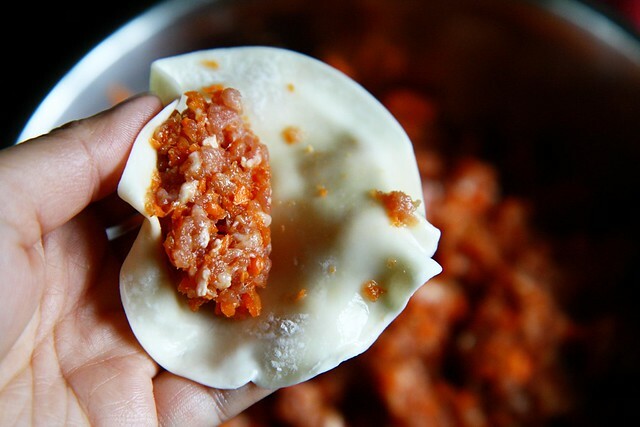 Scoop a dollop of the mince filling into the middle of the dumpling skin. 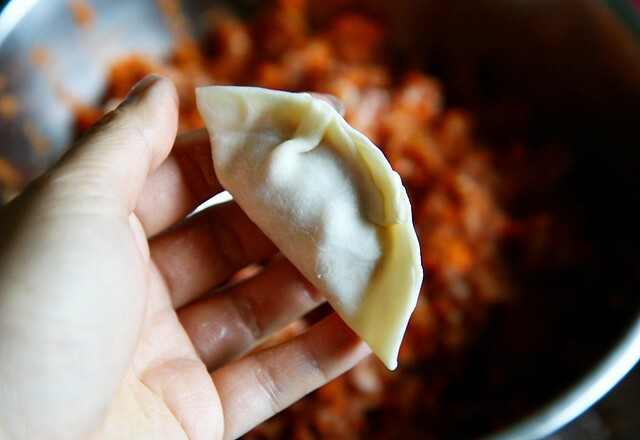 The rule is not to overstuff your dumplings or else you won't be able to seal them without the filling spilling out. If the store bought skins are a little dry, just smear some water over them. 3. Wet one corner with water in order to seal the skin. 4. Press both sides in the middle so that they're sealed tight. 5. And do a a pleat on either side. 6. 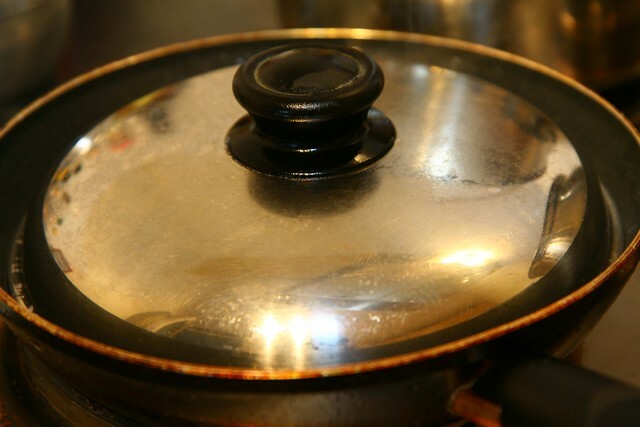 Get a non stick frying pan and drizzle a little sunflower oil (or vegetable oil but do not use olive oil as they burn fast) under medium heat. 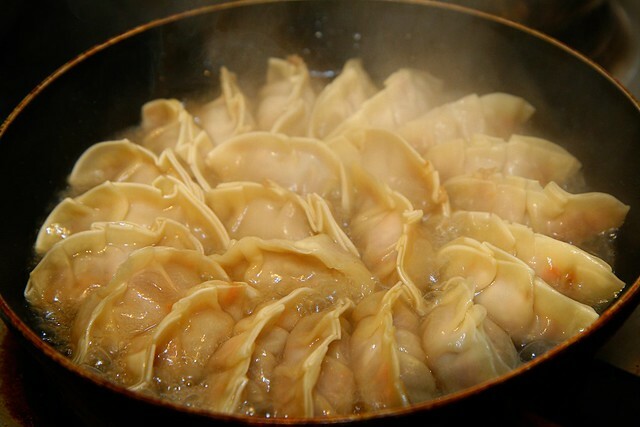 Lined the uncooked dumplings around the pan. Brown the base. 7. Once the base is brown, pour 1/4 glass of water (more if you're using a bigger pan). Turn up the heat to high. 8. Cover the pan so that the steam will cook the fillings thoroughly. Remove the lid once the water has been reduced. Turn down the heat to low. Continue cooking under low heat until the base is crispy. A decade ago, a friend suggested that I pour in a cornflour mixture to get a crispy base but it never worked. 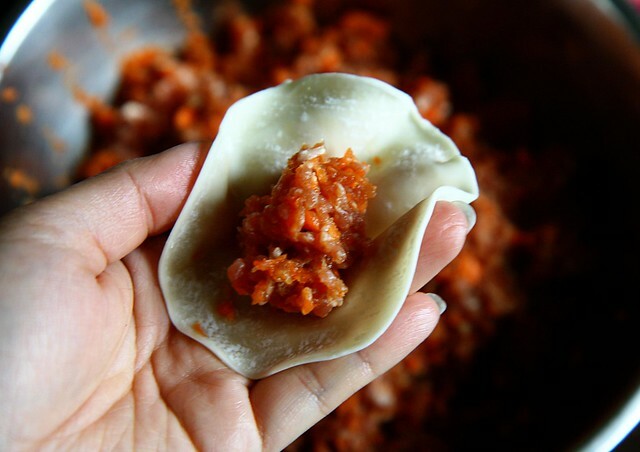 I noticed that the starch from the dumpling skin will do the same job easily. Oh boy I love these little things, I can hoover up a plateful in minutes, oh I wonder if I can source the skins up here? Ooh I'm very excited! Tabitha, you can get them from the frozen section at an Asian supermarket. The fresh ones are even better but harder to find. That looks SOO delicious but I have to admit, instead of jotting down your recipe and trying it out myself, I'm going to call my mom tonight and see if she can make me some. The beauty of now living 10 mins from her is I can shed any vestige of shame and ask her to cook up the Chinese dishes I'm craving. I think she's a little scared of what creations I would come up with on my own - both of us understand that I am certainly no "good CHINESE wife". Lol! Lindsay, if it made you feel better, when I'm back in NZ, I suddenly lose every ability to cook. Mom's around and she's an amazing cook so why bother. LOL. You lucky LUCKY thing! Mom only 10 mins away. I'm so envious. Also, I told one of my friends about all your "Lazy Cook" yummy recipes. She wanted to know if you have one for pho that you could share!! Cubie, I must've read your mind! I think the cold weather makes dumplings the perfect thing to eat. OMGOSH!! i am just like you i love love eating gou tie! not a fan of shia jia as much.. i think it's because anything fried just tastes better haha!! yours however look DIVINE!! maybe i should attempt to make these from scratch i'm missing chinese food so badly here! I was looking for interesting blog to follow and I found yours. I hope you can visit and follow mine too! See you! I haven't had too many encounters with "dumplings" but I have had some okay ones and some good ones and the good ones looked like yours. I bet they tasted so good, they look so crispy and caramelized on the bottom...yummy! I would never have thought to make them myself but you make it looks so easy. Luckily I have many great Asian markets I can go shopping at...Hooray! Ps LOL at the numbers! Ooh I LOVE dumplings!! I always intend on making my own and freezing a big batch but I usually give up and buy them here at Trader Joe's frozen...yours look delish! They look DELICIOUS! Love dumplings! Lisa, good luck trying to find authentic Asian food if you live in a small town. I think you'll have to make these from scratch now. Katrina, I'm naughty. Sometimes, I dump the cooked pot stickers back into the pan and get all the 3 sides really brown. I just like the crispy bits. Let me know how you go with making these. They're really easy. S, at least you're craving for good stuff. I have a friend who used to crave for soil!! Kat, I've bought frozen ones and thought they were great but hubby detested them. So it was back to making them. Kim, I didn't know! Honestly, I had no idea about the superstitions behind these numbers. Gosh, I was told off so badly by these Asian customers. Mona, Give them a try because they're really easy to make. I'm seriously salivating... I love potstickers! These look fantastic, so i'll definitely have to convert the measurements and make this myself! You always post the best recipes!